a cup of cocoa on a cold winter's day. When my kids were younger we went sledding down the hill in our backyard almost every day....and afterwards we would come in and have hot cocoa. That is what this card reminds me of. The background is cardstock I printed using my Cricut Imagine "Christmas Wish" cartridge. If you have a Cricut Explore you can print this in the Cricut Design Space. The image was also print & cut with my Cricut Explore....she is one of Sherri Baldy's 3D pre-colored Besties Coffee Bestie but since I don't drink coffee I wrote Cocoa on the cup. The snowdrifts were made with a die from Paper Sweeties Sweet Cuts die set Thanks Snow Much ... I lightly chalked the tops and then sprayed them with Diamond Dust so they would glisten like snow. I finished it off with a few snowflakes. OMG that is absolutely sooo sweet! How very cute she is! 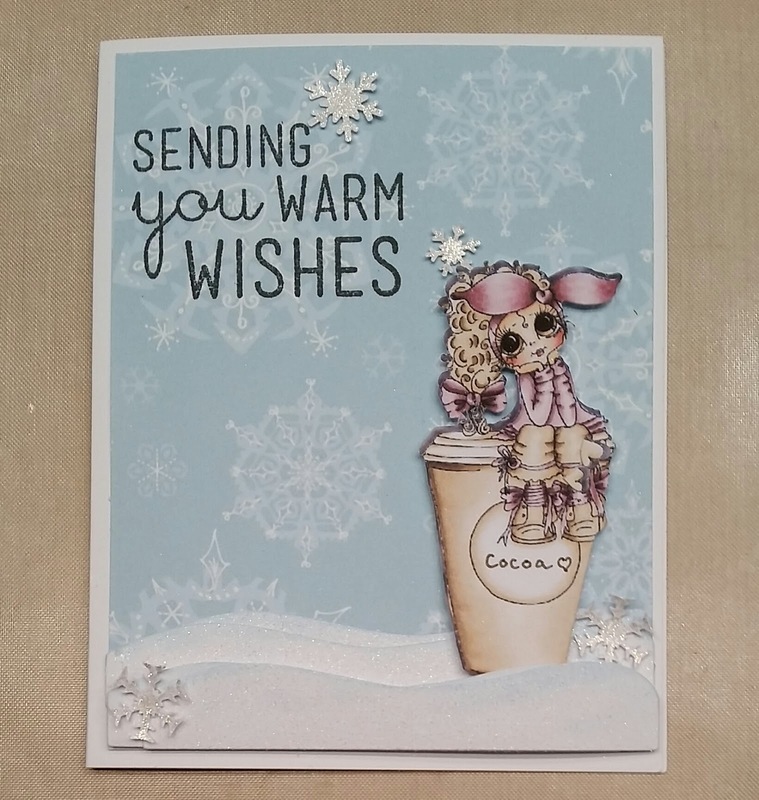 Your card is so pretty... love the colors and the snowflakes! Happy Cocoa Day! What a sweet card and memories, gotta love those. Just love it, so sweet. I use to do the same thing with my son and it was so fun. Those are great memories for us to have. What a sweet card, love your background! Nice to visit your blog again, Happy Holidays! This is soooooooooo sweet! I love it!!!!!!!!!!!!!!!!!!!!! Oh what a darling image and the coloring is fantastic, and love the background scenery. Beautiful card. BEAUTIFUL image! Made me smile. Love how you colored it up. So soft and soothing! Oh what a super sweet card! Thank you for entering My Besties Meet at the Scrappers Corner and best of luck with your entry. 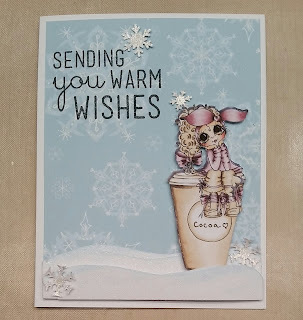 WOW soo Adorable card!Thanks for joining us at My Besties International Challenge. Oh, this is precious! Love the soft colors, too. How Wonderful I love your card. Beautiful card ! Thanks for joining us over here at My Besties Meet at the Scrappers Corner. Thank you so much for entering our challenge at Meet At The Scrappers Corner Looking forward to see you again soon. Love your project thank you for joining us at My Besties Meet at the Scrappers Corner Challenge, good luck with your entry. This is a wonderful creation and perfect for our 19th ‘ANYTHING GOES’ Challenge with a Besties Image’ challenge. Thanks for sharing your talent with us. Good luck. Wishing you a blessed festive season.